In the process of looking for new sources for my Abraham Lincoln ghostlore book, I was flipping through the 1907 volume entitled The Escape and Suicide of John Wilkes Booth, which puts for the proposition that Booth actually died in 1903 by suicide, not in a barn of a gunshot wound in 1865. The body of the guy said to be Booth was embalmed so well as to be mummified (as was Lincoln’s), and became a carnival attraction for a while. The book contained a lengthy analysis of the corpse’s palm, read while it was still the morgue by one Bentley Sage. Looking up Bentley Sage was sort of a rabbit hole – the guy is described as awfully famous in the book, but most articles about him in newspapers are really just classified ads that he took out himself. His price for readings goes gradually down from 1901 to 1907 (from three bucks to fifty cents), but he never seems to have made much hay out of reading “Booth’s” palm, except for this 1905 ad on the right, in which he also claimed to have read HH Holmes’ palm, as well as the palms of such Chicago notables as Marshall Field, Carter Harrison. In one ad, he claimed to be able to train anyone to become a spiritual medium in 3-6 months. I’m finishing up the draft of my new book on Lincoln ghostlore for Llewellyn Worldwide – it’s been fun tracing all the stories back to their origins! Here’s one find that I should really wait on, but I got so excited by it that I just had to post it. 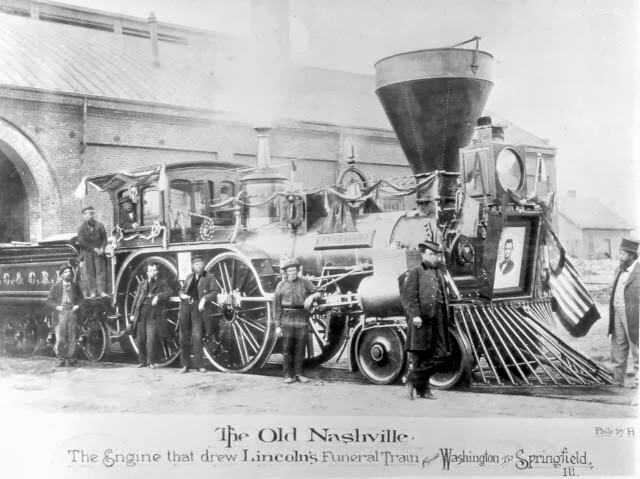 The Lincoln Funeral Train is sometimes said to haunt Chicago (it pulled in around where Michigan and Roosevelt intersect today on May Day, 1865), so it’s relevant to this blog as well as the book. Many books that mention the “phantom train” have quoted from an Albany newspaper that described the ghost train. Lloyd Lewis quoted about 200 words of it in his seminal Myths After Lincoln, and other sources since have been paraphrasing Lewis’s excerpt. None of them ever seemed to give the actual title or date of the article, so it took a little bit of searching, but I eventually did track it down. It turns out that the story was published in the Albany Daily Evening Times on March 23rd, 1872. 1872! Not quite seven years after the actual train had rolled through. This makes it a very early source for Lincoln lore, most of which wouldn’t start to be published for a couple more decades. He then told of the phantom train that every year comes up the road, with the body of Abraham Lincoln. Regularly in the month of April about midnight, the air on the track becomes very keen and cutting. On either side it is warm and still; every watchman when he feels this air steps off the track and sits down to watch. Soon after, the pilot engine with long black streams, and a band with black instruments playing dirges, and grinning skeletons sitting all about, will pass up noiselessly, and the very air grows black. If it is moonlight, clouds always come over the moon, and the music seems to linger as if frozen with horror. A few moments after the phantom train glides by. Flags and streamers hang about. The track ahead seems covered with a black carpet, and the wheels are draped with the same. The coffin of the murdered Lincoln is seen lying on the center of a car, and all about it, in the air, and on the train behind are vast numbers of blue coated men, some with coffins on their backs, others leaning upon them. It seems that all the vast armies of men who died during the war are escorting the phantom train of the President. The wind, if blowing, dies away at once, and over all the air a solemn hush, almost stifling, prevails. If a train were passing, its noise would be drowned in this silence, and the phantom train would rise over it. Clocks and watches always stop, and when looked at are found to be from five to eight minutes behind. Everywhere on the road about the 20th of April the time of watches and trains is found suddenly behind. This, said the leading watchman, was from the passage of the phantom train. 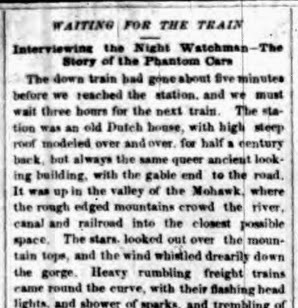 One informant had commenced with another story of the “death engine” which preceded every train to which an accident would happen, when the stationman called out “train coming!” and we reluctantly came away from this garrulous watchman, whose life-work, both physical and spiritual, seemed a perpetual romance. Just about every “Lincoln Ghost Train” story descends from this article. It’s hard to take it completely seriously (surely they don’t expect us to believe that ALL of the soldiers who died were carrying coffins on the train, but that it could go by in five minutes, right?) Still, the prose here is just terrific – it would do any horror writer proud. Look for the Lincoln ghostlore book next year!